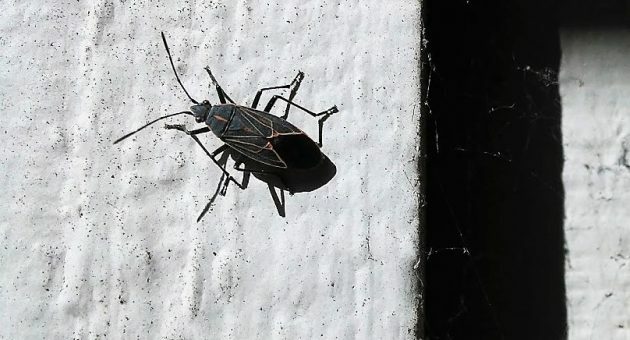 The dreaded box elder bugs are making their annual appearance in the mid-valley again this fall, though not in overwhelming numbers as far as I can see. Why “dreaded”? 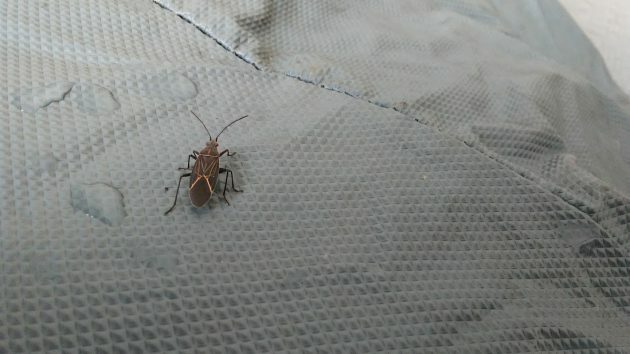 After all, the box elder or maple bugs don’t actually do any harm. Except when they have penetrated the outer defenses of your house and start landing on you, just by chance, in the middle of the night, and you feel something crawling on your face..
What’s happening, according to what you can read in any number of publications online, is that these little beetles are looking for a warm place to spend the winter. They have spent the summer in, presumably, the maples and other deciduous trees that are all around us. Now they know that winter is coming, and they want to be comfortable. But in fine weather in the fall, they still like to buzz round a few more times and sun themselves on any surface where it’s warm. Years ago, the local paper would run the occasional feature on how to get rid of box elder beetles. The advice I remember is to spray them with soapy water on the surfaces where they rest in the sun. I tried that a few times and it works. But it does not, alas, get rid of all of them. And I always wondered whether this treatment left the survivors not only cleaner but also even more determined to get inside. So it’s probably best just to keep them out of the house as much as you can, pick off the ones that do get in, and look forward to spring, when all of them will once again disappear into the trees for another year. Add stink bugs and ladybugs and you’ve got our house….ugh. Am breathing a sigh of relief after having absorbed Hasso’s incisive examination of this mild scourge. Thanks for a fun article! I enjoy your informative articles and commentary. HH, are you softening just like the melting polar ice caps on the climate change denial?